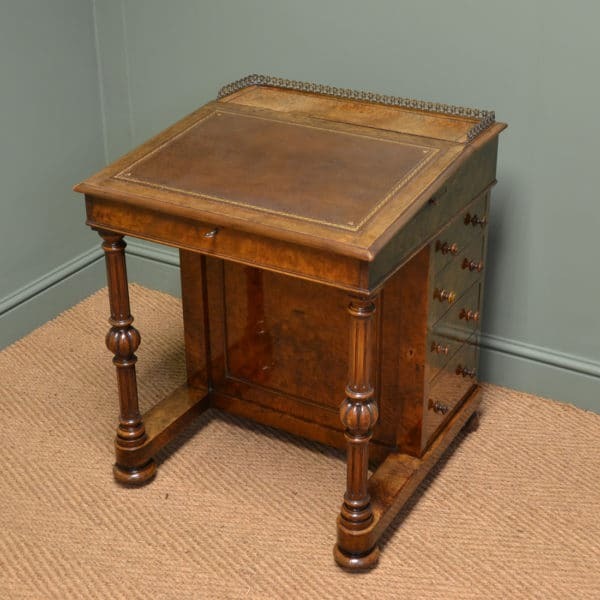 The antique davenport desk was first recorded in the George III period of the 1790s, in the records of the renowned cabinet maker Gillows of Lancaster and it states ‘Captain Davenport desk’. 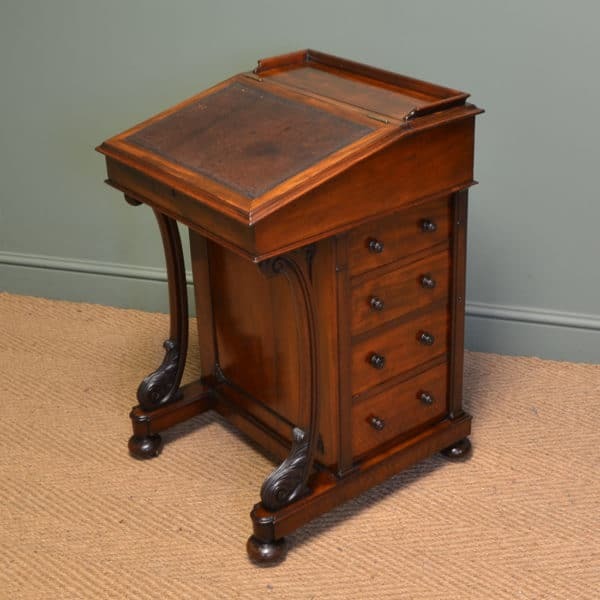 It was first built and commissioned for Captain Davenport and this is the first example of this type of small writing desk, now called by the captain’s name. During most of the late Georgian and Victorian eras, the davenport was mainly used by the Lady and would have of a small chest of drawers with a desk on top. 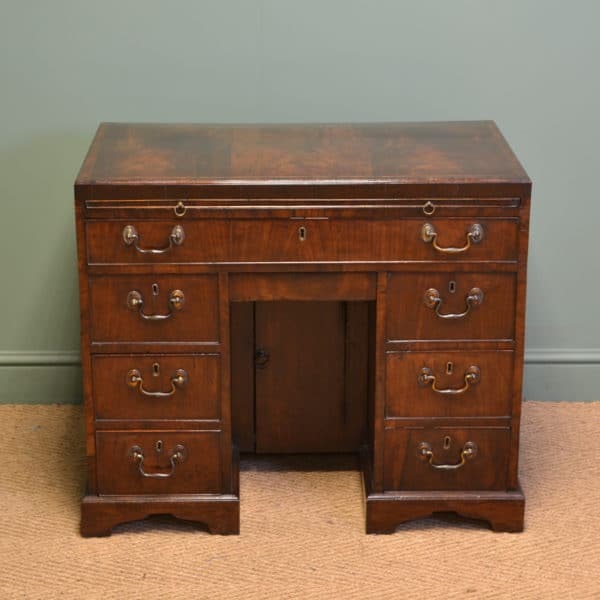 The antique davenport desk changed very little in design over the many years it was in production and most antique davenports have four drawers that open at one side and have faux drawer fronts on the opposite side. Above the drawers there is sometimes a pull-out slide to hold papers and some examples have cupboards concealing drawers. 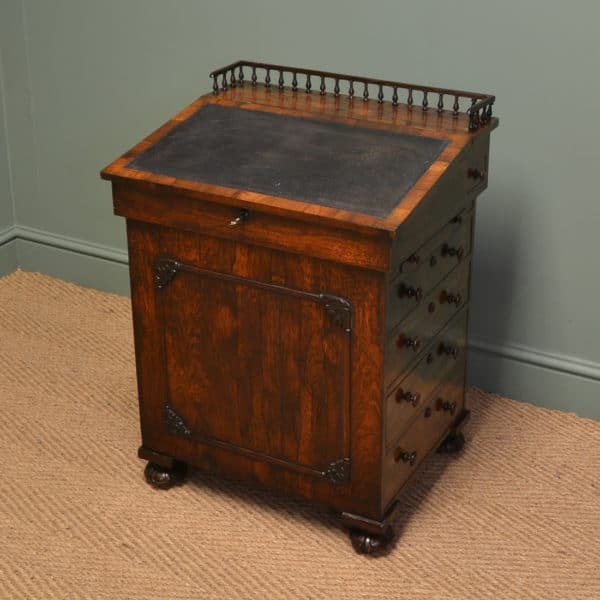 Many antique davenports are fitted with casters at the bottom so they can be moved around easily. 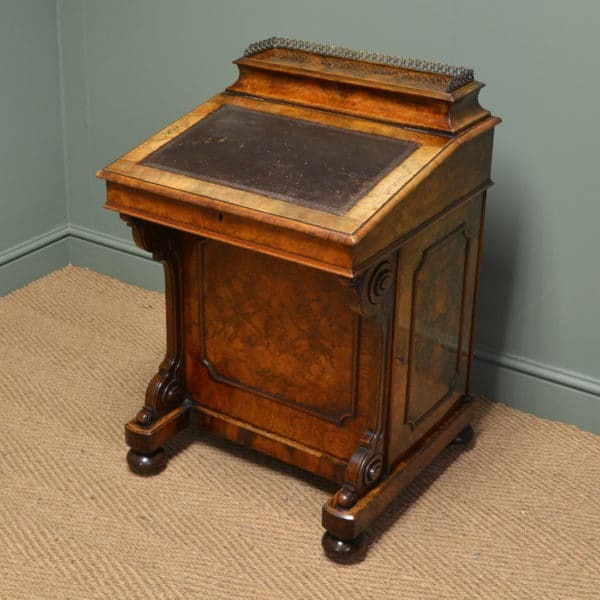 The top sections usually have a desk with a sloping lid and a leather writing surface, with a lift up lid. Occasionally they come with a decorative brass gallery at the back. They usually have small drawers for storing writing equipment and ink wells. The best examples have a ‘piano top’ whereby the top looks like the back of a piano but when pushed on, it opens up revealing lots of lovely compartments. The Victorian davenport desks are usually supported on elaborately scrolled or turned supports that allow a recessed space for more leg room. 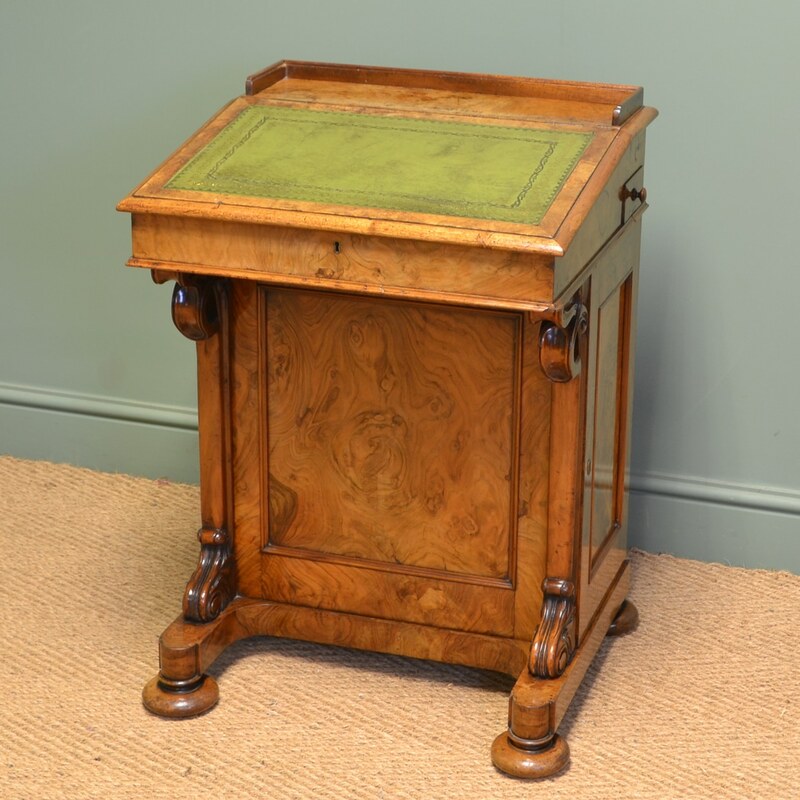 Mahogany wood was the most popular used in construction but some very nice examples were made in rosewood or burr walnut and some of the best examples would have stringing inlaid lines of brass or box wood and with decorative brass drawer handles, brass galleries at the back and brass castors. Some Victorian davenports had wood turned galleries or would be fretwork carved and would have turned wood knobs. The antique davenport design was still in production up to the late Edwardian times and is still a very popular piece to buy today. 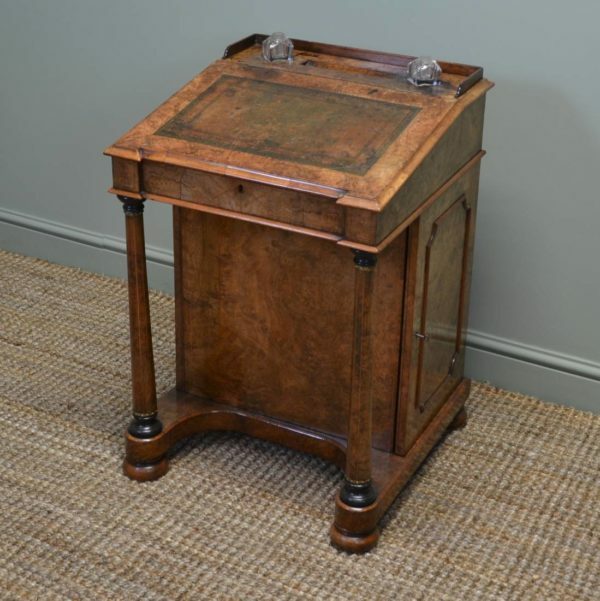 If you are interested in buying an antique davenport, then visit our antique desks section or have a look below at our lovely examples available for sale. 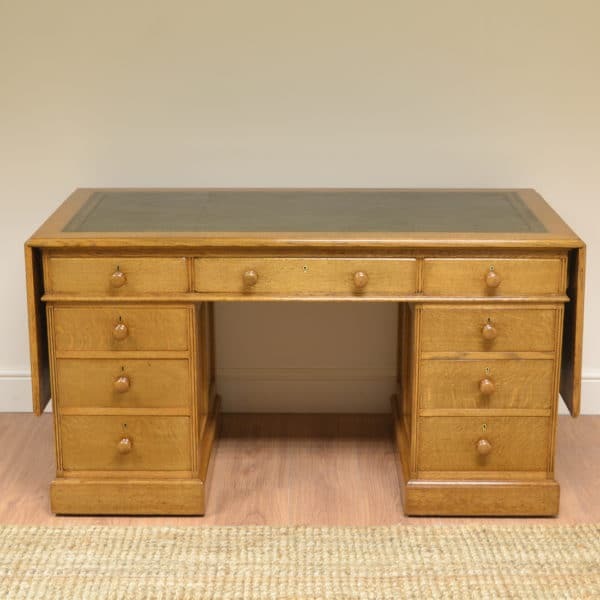 Dear James, Just to confirm that I received my Bureau today, and that I’m very pleased with it. Can I also ask you to pass on my grateful thanks to your two delivery men. They did a fantastic job in getting the Bureau up onto the first floor for me. Not only did they cope with the difficult stairs, but they also had an extremely hard time in getting the Bureau up and over the top banister rail. A job very well done. Thank you.